As It Happened: Thursday At The Republican Convention : It's All Politics Mitt Romney accepted his party's presidential nomination and promised to end four years of "disappointment and division." President Obama, he said, has failed to solve the nation's problems and it's time for him to leave the White House. 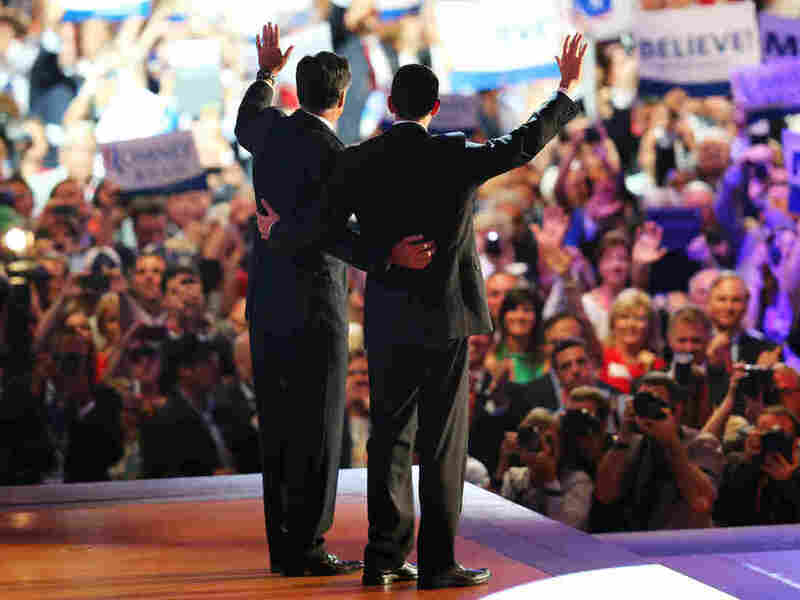 The Republican ticket: Mitt Romney (left) and Rep. Paul Ryan wave as the 2012 Republican National Convention winds up Thursday in Tampa, Fla. Romney accepted the party's presidential nomination. Ryan is his running mate. The former Massachusetts governor, who first sought the White House in 2008, said he has a five-point plan that would create 12 million jobs and promised he would direct a foreign policy with "backbone." We live blogged through the evening. And our colleague Frank James hosted a live chat where there's analysis and online conversation. Scroll down and "read up" if you want to see how the evening went. "Everywhere I go in America," Romney says, "there are monuments that list those who have given their lives for America. There is no mention of their race, their party affiliation, or what they did for a living. They lived and died under a single flag, fighting for a single purpose. They pledged allegiance to the United States of America." "That America, that united America, can unleash an economy that will put Americans back to work, that will once again lead the world with innovation and productivity, and that will restore every father and mother's confidence that their children's future is brighter even than the past. "That America is the best within each of us. That America we want for our children. "If I am elected president of these United States, I will work with all my energy and soul to restore that America, to lift our eyes to a better future. That future is our destiny. That future is out there. It is waiting for us. Our children deserve it, our nation depends upon it, the peace and freedom of the world require it. And with your help we will deliver it. Let us begin that future together tonight." An now it's time for confetti and balloons. The candidates and the families are onstage. "President Obama has thrown allies like Israel under the bus, even as he has relaxed sanctions on Castro's Cuba," Romney says. "He abandoned our friends in Poland by walking away from our missile defense commitments, but is eager to give Russia's President Putin the flexibility he desires, after the election. Under my administration, our friends will see more loyalty, and Mr. Putin will see a little less flexibility and more backbone." Delegates love this line: "President Obama promised to begin to slow the rise of the oceans and heal the planet. My promise is to help you and your family." "First, by 2020, North America will be energy independent by taking full advantage of our oil and coal and gas and nuclear and renewables. "Second, we will give our fellow citizens the skills they need for the jobs of today and the careers of tomorrow. When it comes to the school your child will attend, every parent should have a choice, and every child should have a chance. "Third, we will make trade work for America by forging new trade agreements. And when nations cheat in trade, there will be unmistakable consequences. "And fourth, to assure every entrepreneur and every job creator that their investments in America will not vanish as have those in Greece, we will cut the deficit and put America on track to a balanced budget. "And fifth, we will champion small businesses, America's engine of job growth. That means reducing taxes on business, not raising them. It means simplifying and modernizing the regulations that hurt small business the most. And it means that we must rein in the skyrocketing cost of healthcare by repealing and replacing Obamacare." That mention of repealing "Obamacare" gets a big roar of approval. Romney's getting big cheers for a series of lines about how Americans celebrate success instead of demonizing it — something he and Republicans accuse President Obama of doing. "In America, we celebrate success, we don't apologize for it," he says. Talking about his business as head of an investment firm, Romney says that he thought about trying to get the Mormon church's pension fund to invest, but decided against it because "I didn't want to go to hell" if it lost money. There's a problem, Romney says, of President Obama and what many Americans now think of him, "when the best feeling you had was the day you voted for him." Romney talks of his mother and says he can still hear her saying, "Why should women have any less say than men in the great decisions facing our nation?" That's a crowd pleaser. "I wish President Obama had succeeded because I want America to succeed," Romney says. "But his promises gave way to disappointment and division. This isn't something we have to accept. Now is the moment when we can do something. With your help we will do something." There are protesters high in the arena shouting about profits and progress. They're being removed. Not long after the start of his address, Romney gets in a reference to the "you didn't build that" line they've been hammering President Obama for saying. Talking of the American dream and what Americans want, Romney says it includes "freedom to build a life, and yes freedom to build a business with their own hands!" Update at 10:37 p.m. ET. Romney Accepts The Nomination. The nominee has entered the arena floor from one corner of the building. He's walking along a line of delegates, shaking hands. It looks a bit like the scene in the Capitol when a president enters for the State of the Union. As Sen. Marco Rubio continues to tell the nation why Romney is a better choice than President Obama, Twitter is lighting up with comments about Clint Eastwood's appearance. On our live chat, there's a question on whether it will help or hurt Romney's campaign. Sen. Marco Rubio of Florida on the president: "Our problem with President Obama isn't that he's a bad person. ... Our problem is he's a bad president." Rubio says that "Hope and change has become divide and conquer." Clint Eastwood's appearance is one of the most unusual, to say the least, at any convention in recent memory. He's talking to an empty chair, pretending it is President Obama. He just asked "Obama" if he has a message for Romney. "He can't do that to himself," Eastwood says. "You're absolutely crazy. You're getting as bad as Biden." The actor took shots at "Obama" for not creating jobs, for setting a departure day for troops in Afghanistan and on other issues. He said he cried the night Obama was elected — not tears of anger or joy but because of the historic nature of the president's election. But now the U.S., he said, needs a businessman in the Oval Office. And after about 10 minutes he ends by leading the delegates in a chant of "Make My Day!" To huge cheers, the actor comes onstage — the screen in the background showing a profile of him back in his gunslinger days on the silver screen. Tuesday night, Ann Romney spoke of how mothers often bear extra burdens. Each night, she said, you can almost "hear a collective sigh from the moms and dads across America who made it through another day. ... You'll hear the women sighing a little bit more than the men. It's how it is, isn't it?" Just now, there's a video about the Romneys. Mitt Romney is seen talking about how sometimes when he would call home from the road at night he would hear their five sons making noise in the background. He would say to Ann, "Don't forget that what you're doing is more important than what I'm doing." If you're looking for the videos the convention is showing and videos of the speakers, convention organizers are posting them here. Mike Eruzione, one of the heroes on the U.S. hockey team that won the gold medal at the 1980 Winter Olympics in Lake Placid, inspires — you know it — a chant of "USA! USA! USA!" He's onstage to talk of the work Romney did guiding the 2002 Winter Olympics in Salt Lake City. "He kept the Olympic fire burning," Eruzione says. Now, "America needs Mitt Romney's leadership." We've put up a separate post — "With Tears And Thanks, Friends Add Context To Romney's Mormon Faith." After fleshing out Romney's faith, the convention has now turned to his career in business — and contrasting it with the problems Republicans see with the current president. Tom Stemberg, the founder of Staples (a company Romney's firm helped get started), says "you have to ask yourself: Why would an administration that can't create any jobs demonize someone who did? I've got a theory. I think when it comes to jobs, new businesses, and economic growth — they just don't get it. They say that Mitt Romney is out of touch with ordinary Americans. They just don't get it." "In the midst of making the final decision to run for president — which had to be the most difficult of their lives — when they heard of Kate's passing, both Mitt and Ann paused, to personally reach out to extend us sympathy, and express their love. "It seems to me when it comes to loving our neighbor, we can talk about it, or we can live it. "The Romneys live it every single day." "David, knowing Mitt had gone to law school at Harvard, asked Mitt if he would help him write a will. He had some prized possessions he wanted to make sure were given to his closest friends and family. "The next time Mitt went to the hospital, he was equipped with his yellow legal pad and pen. Together, they made David's will. That is a task that no child should ever have to do. But it gave David peace of mind. "So, after David's death, we were able to give his skateboard, his model rockets, and his fishing gear to his best friends. He also made it clear that his brother, Peter, should get his Ruger 22 rifle. "How many men do you know would take the time out of their busy lives to visit a terminally ill 14-year-old and help him settle his affairs?" Craig Bennett, a friend of Romney's and a fellow member of the Church of Jesus Christ of Latter-day Saints, is taking the most time of any speaker so far to talk about the candidate's Mormon faith. The church, he says, has "an unpaid, lay clergy." "So, what specifically did Mitt Romney do as our pastor? "For one or two evenings each week and several hours every weekend — week after week and year after year — he met with those seeking help with the burdens of real life, burdens we all face at one time or another: unemployment, sickness, financial distress, loneliness. "Mitt prayed with and counseled church members seeking spiritual direction, single mothers raising children, couples with marital problems, youth with addictions, immigrants separated from their families, and individuals whose heat had been shut off. "To uphold the dignity — and respect the privacy — of those who came, he met with them in private and in confidence. He has upheld that trust. "Mitt taught faith in God, personal integrity, self-reliance and service to our fellow men. And Mitt did what he challenged us to do. He led by example. "I treasure every minute we served together." "Fact is, this election is not about just one office. It is about one nation. If we want to continue to be the greatest nation on the planet, we must give our kids what we promise them: An equal opportunity. That starts in the classroom. It starts in our communities. It starts where you live. "And it starts with electing Mitt Romney the next President of the United States." Departing from his prepared text, former Florida Gov. Jeb Bush just said of his brother — the nation's 43rd president — that George W. Bush "kept us safe" during "incredibly challenging times." That brought the delegates to their feet. "The sad truth is that equality of opportunity doesn't exist in many of our schools. We give some kids a chance, but not all. That failure is the great moral and economic issue of our time. And it's hurting all of America." If you don't want to miss Romney's address, convention officials now say it's set to start at 10:32 p.m. ET. He's expected to finish at 11:02 p.m. ET. Newt Gingrich, a onetime rival who used to call Romney a "Massachusetts moderate," and his wife, Callista, have followed with more words of praise for President Reagan — and then a linking of President Obama to one of his unpopular Democratic predecessors. "President Carter and President Obama weakened the nation," says Newt Gingrich. And they "both weakened American respect abroad," says his wife. It's the first mention of Carter that we've heard from the podium this week. That video is playing now. It's as if the former president himself is the narrator. They've skillfully used audio from his many addresses to tell his story and his view of America. The night's session has begun, with the Pledge of Allegiance, national anthem, a prayer and word from House Speaker John Boehner that (as if no one knew), Mitt Romney and Paul Ryan are officially the party's nominees. We're betting the first emotional highlight of the evening will be around 7:52 p.m. ET, when delegates are set to see a video tribute to former President Ronald Reagan.